About 21%–40% of the energy from the fuel you put in a hybrid is used to move it down the road, depending on the drive cycle. Hybrids are more efficient than comparable conventional vehicles, especially in stop-and-go driving, due to the use of regenerative braking, electric motor drive/assist, and start/stop technologies—see How Hybrids Work for details. Still, much of the energy is lost to engine and driveline inefficiencies or used to power accessories. Like conventional gasoline-powered vehicles, most of the energy in the fuel that goes into a hybrid is lost in the engine, primarily as heat. Smaller amounts of energy are lost through engine friction, pumping air into and out of the engine, and combustion inefficiency. The power steering, ignition system, and engine control system use energy generated by the engine. When you apply the brakes in a conventional vehicle, energy initially used to overcome inertia and propel the vehicle is lost as heat through friction at the brakes. Hybrids use regenerative braking to recover some energy that would otherwise be lost in braking. This makes hybrids more efficient than comparable conventional vehicles, especially in stop-and-go traffic. Hybrids reduce idling by turning the engine off when the vehicle comes to a stop and restarting it when the accelerator is pressed. This makes hybrids more efficient than comparable conventional vehicles in city driving, which includes a significant amount of idling. Hybrids use regenerative braking to recover energy typically wasted in braking. Since more braking takes place in stop-and-go traffic, hybrids are most efficient in city driving. When you apply the brakes, the vehicle's inertia turns an electric motor-generator, producing electricity that is then stored in a battery. The electricity can later be used to power the electric motor, which supplies power to the wheels. This also allows the vehicle to sometimes use the electric motor to power the vehicle at lower speeds, where a combustion engine is typically less efficient. Hybrids use regenerative braking to recover some energy that would otherwise be lost in braking. Since there is little braking in highway driving, regenerative braking offers little advantage over a conventional vehicle on the highway. 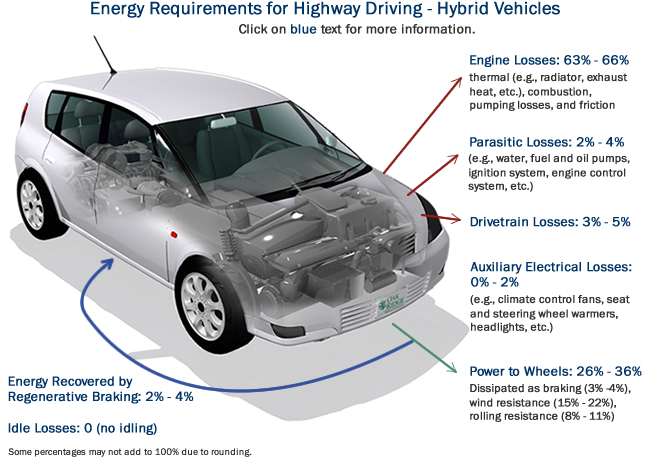 Hybrids use regenerative braking to recover energy typically wasted in braking. The electric motor can be used to power the vehicle at lower speeds, where a combustion engine is typically less efficient. However, since there is little to no idling or low-speed driving, hybrids offer little advantage over conventional vehicles on the highway. Hybrids experience negligible energy losses from idling in combined city-highway driving. In city driving, hybrids reduce idling by turning the engine off when the vehicle comes to a stop and restarting it when the accelerator is pressed. In highway driving, there is little to no idling. Lohse-Busch, H., M. Duoba, E. Rask, K. Stutenberg, et al. 2013. Ambient Temperature (20°F, 72°F and 95°F) Impact on Fuel and Energy Consumption for Several Conventional Vehicles, Hybrid and Plug-In Hybrid Electric Vehicles and Battery Electric Vehicle. SAE Technical Paper 2013-01-1462. DOI:10.4271/2013-01-1462.